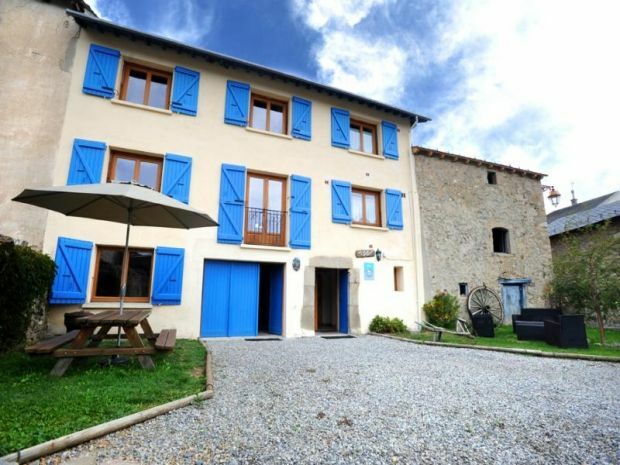 Great detached and renovated house, located in the village, South facing the mountains. 1st floor: clear living room (fireplace insert) with kitchenette, 1 bedroom (1 double bed ), private shower-room and toilet. 2nd floor: 2 bedrooms (1 double bed) (1 double bed, 2 bunk beds 1 person), bathroom (shower and bath), toilet. Enclosed garage (1 car), private laundry, storage area (ski, bikes...). Large enclose Court reserved for the cottage (garden furniture, barbecue, parking). Lava-Lin, TV, Fireplace, Terrasse, Jardin, Garage, Animaux acceptés, Matériel bébé, Local à vélo, Lave vaisselle, Connexion Internet, Congélateur, Micro-ondes, Sèche linge, Espace ext. clos, Barbecue. Option à régler sur site : OPTION SERVICE DE MENAGE EN FIN DE SEJOUR (€): : 70 €. OPTION LINGE DE TOILETTE (€/PERS. ): : 3 €. OPTION BOIS DE CHAUFFAGE POUR CHEMINEE (€): : 15 €. Your host: We welcome you to "Cal Manout" in an authentic cottage, quiet, warm and charmingly renovated in the mountain style. We will advise you on the many walks, on the various sites to discover (the medieval cities of VAUBAN, solar ovens, spa, animal park ...) And for those who prefer lazing the private courtyard facing south and facing the mountains will allow a well deserved rest. See you soon at the cottage "Cal Manout". Gîte charmant, très bien équipé et agréablement décoré, bien situé. Les propriétaires sont très accueillants et serviables. L'accès à la station de Pyrénées 2000/Font-Romeu se fait facilement en voiture (nous n'avons pas testé la navette, qui est à 2 pas du gîte).